The Punic Wars were a series of three wars fought between Rome and Carthage between 264 and 146 B.C.E. They are known as the Punic Wars because the Latin term for Carthaginian was Punici (older Poenici, from their Phoenician ancestry). The main cause of the Punic Wars was the clash of interests between the existing Carthaginian Empire and the expanding Roman Republic. The Romans were initially interested in expansion via Sicily, part of which lay under Carthaginian control. At the start of the first Punic War, Carthage was the dominant power of the Western Mediterranean, with an extensive maritime empire, while Rome was the rapidly ascending power in Italy. By the end of the third war, after more than a hundred years and the deaths of many thousands of soldiers from both sides, Rome had conquered Carthage's empire and razed the city, becoming the most powerful state of the Western Mediterranean. With the end of the Macedonian wars—which ran concurrently with the Punic wars — and the defeat of the Seleucid King Antiochus III the Great in the Roman-Syrian War (Treaty of Apamea, 188 B.C.E.) in the eastern sea, Rome emerged as the dominant Mediterranean power and the most powerful city in the classical world. Victory over Carthage in these wars gave Rome a preeminent status it would retain until the division of the Roman Empire into the Western Roman Empire and the Eastern Roman Empire by Diocletian in 286 C.E. After Carthage's defeat, only Greece remained as a power in the Mediterranean in addition to Rome. Victory over Carthage added considerable territory to the Roman Empire, which in turn resulted in the expansion of both the imperial civil service in order to govern new provinces and of the army to police them. Subsequent to the Punic Wars, the army played an increasingly important part in the life and politics of the empire. This period of Roman history was later romanticized as a heroic age when "all Romans were virtuous and everything worked" while the figure of Hannibal, the brilliant Carthaginian general, was demonized. Arguably, the Punic Wars transformed Rome from a regional to an international power. The structure that developed to rule the emerging empire gave it stability, so that Romans could begin to regard their imperial project as one of bringing law, order and security to the known world. This administrative and political structure was destined to become the foundation not only of most European systems of government but also of that of the United States and of other states outside of the European space, such as Australia and post-World War II Japan. Rome's legal system continues to form the basis of law in the modern world. The way in which the Punic wars ended represents a major turning point in human history. In addition to transforming Rome's role in the classical age, it also meant that the civilization of the ancient Mediterranean passed to the modern world via Europe instead of Africa. The Romans were themselves convinced that divine intervention lay behind their defeat of Carthage, and that it was their destiny to rule the world. In 264 B.C.E., Carthage was a large port city located on the coast of modern Tunisia. Founded by the Phoenicians in the middle of the ninth century B.C.E., it was a powerful city-state with a large and lucrative commercial empire. Of the great city-states in the western Mediterranean, only Rome rivaled it in power, wealth, and population. While Carthage's navy was the largest in the ancient world at the time, it did not maintain a large, permanent, standing army. Instead, it relied on mercenaries, hired with its considerable wealth, to fight its wars. However, most of the officers who commanded the armies were Carthaginian citizens. The Carthaginians were famed for their abilities as sailors, and unlike their armies, many Carthaginians from the lower classes served in their navy, which provided them with a stable income and career. In 264 B.C.E. the Roman Republic had gained control of the Italian peninsula south of the Po river. Unlike Carthage, Rome had large standing armies made up almost entirely of Roman citizens. The lower class, or plebians, usually served as the foot-soldiers in Roman legions, while the upper class, or patricians, served as the commanding officers. On the other hand, at the start of the First Punic War the Romans had no standing navy, and were thus at a disadvantage until they began to construct their own large fleets during the war. The First Punic War (264 B.C.E.-241 B.C.E.) was fought partly on land in Sicily and Africa, but was also a naval war to a large extent. The struggle was costly to both powers, but after more than 20 years of war, Rome emerged victorious, at last conquering the island of Sicily and forcing the defeated Carthage to pay a massive tribute. The effect of the long war destabilized Carthage so much that Rome was able to seize Sardinia and Corsica a few years later when Carthage was plunged into the Mercenary War. The war began as a local conflict in Sicily between Hiero II of Syracuse, and the Mamertines of Messina. The Mamertines had the bad judgment to enlist the aid of the Carthaginian navy, and then betray the Carthaginians by entreating the Roman Senate for aid against Carthage. The Romans sent a garrison to secure Messina, and the outraged Carthaginians then lent aid to Syracuse. With the two powers now embroiled in a local conflict, tensions quickly escalated into a full-scale war between Carthage and Rome for the control of Sicily. After a vicious defeat at the Battle of Agrigentum in 261 B.C.E., the Carthaginian leadership resolved to avoid further direct land-based engagements with the powerful Roman legions, and concentrated on the sea, where they believed they had an advantage. Initially, the experienced Carthaginian navy prevailed against the fledgling Roman Navy in the Battle of the Lipari Islands in 260 B.C.E. Rome responded by drastically expanding its navy in a very short time. Within two months the Romans had a fleet of over 100 warships. Because they knew that they could not outmaneuver the Carthaginians in the traditional tactics of ramming and sinking enemy ships, the Romans added an "assault bridge" to Roman ships, known as a corvus. This bridge would latch onto enemy vessels, bring them to a standstill. Then shipboard Roman legionaries were able to board and capture Carthaginian ships through hand-to-hand fighting, a skill that the Romans were more comfortable with. This innovative Roman tactic reduced the Carthaginian navy's advantage in ship-to-ship engagements, and allowed Rome's superior infantry to be brought to bear in naval conflicts. However, the corvus was also cumbersome and dangerous, and was eventually phased out as the Roman navy became more experienced and tactically proficient. Save for the disastrous defeat at the Battle of Tunis in Africa, and two naval engagements, the First Punic War was nearly an unbroken string of Roman victories. In 241 B.C.E., Carthage signed a peace treaty ceding to Rome total control of Sicily. In 238 B.C.E. the mercenary troops of Carthage revolted (see Mercenary War) and Rome took the opportunity to take the islands of Corsica and Sardinia from Carthage as well. From that point on, the Romans effectively controlled the Mediterranean, referring to it as "Mare Nostrum" ("our sea"). Carthage spent the years following the First Punic War improving its finances and expanding its colonial empire in Hispania (the Iberian Peninsula, modern Spain and Portugal), under the Barcid family. Rome's attention was mostly concentrated on the Illyrian Wars. In 219 B.C.E., Hannibal, the son of Hamilcar Barca, attacked Saguntum in Hispania, a city allied to Rome, beginning the Second Punic War. According to Polybius there had been several trade agreements between Ancient Rome and Carthage; even a mutual alliance against king Pyrrhus of Epirus. When Rome and Carthage made peace in 241 B.C.E., Rome secured the release of all 8,000 prisoners of war without ransom and, furthermore, received a considerable amount of silver as a war indemnity. However, Carthage refused to deliver to Rome the Roman deserters serving among their troops. A first issue for dispute was that the initial treaty, agreed upon by Hamilcar Barca and the Roman commander in Sicily, had a clause stipulating that the Roman popular assembly had to accept the treaty in order for it to be valid. The assembly not only rejected the treaty but increased the indemnity Carthage had to pay. Carthage seems to have had a liquidity problem and an attempt to gain financial help from Egypt, a mutual ally of Rome and Carthage, failed. This resulted in delay of payments owed to the mercenary troops that had served Carthage in Sicily, leading to a climate of mutual mistrust and, finally, a revolt supported by the Lybian natives, known as the Mercenary War (240-238 B.C.E.). During this war Rome and Syracuse both aided Carthage, although traders from Italy seem to have done business with the insurgents. Some of them were caught and punished by Carthage, aggravating the political climate which had started to improve in recognition of the old alliance and treaties. Hanno had lost many elephants and soldiers when he became complacent after a victory in the Mercenary War. Further, when he and Hamilcar were supreme commanders of Carthage's field armies, the soldiers had supported Hamilcar when his and Hamilcar's personalities clashed. On the other hand he was responsible for the greatest territorial expansion of Carthage's hinterland during his rule as strategus and wanted to continue such expansion. However, the Numidian king of the relevant area was now a son-in-law of Hamilcar and had supported Carthage during a crucial moment in the Mercenary War. While Hamilcar was able to obtain the resources for his aim, the Numidians in the Atlas Mountains were not conquered, like Hanno suggested, but became vassals of Carthage. The Iberian conquest was begun by Hamilcar Barca and his other son-in-law, Hasdrubal the Fair, who ruled the relatively independent of Carthage and signed the Ebro-treaty with Rome. Hamilcar died in battle in 228 B.C.E. Around this time, Hasdrubal became Carthaginian commander in Iberia (229 B.C.E.). He maintained this post for some eight years until 221 B.C.E. Soon the Romans became aware of a burgeoning alliance between Carthage and the Celts of the Po river valley in northern Italy. The latter were amassing forces to invade Italy, presumably with Carthaginian backing. Thus, the Romans pre-emptively invaded the Po region in 225 B.C.E. By 220 B.C.E., the Romans had annexed the area as Gallia Cisalpina. Hasdrubal was assassinated around the same time (221 B.C.E. ), bringing Hannibal to the fore. It seems that, having apparently dealt with the threat of a Gaulo-Carthaginian invasion of Italy (and perhaps with the original Carthaginian commander killed), the Romans lulled themselves into a false sense of security. Thus, Hannibal took the Romans by surprise a scant two years later (218 B.C.E.) by merely reviving and adapting the original Gaulo-Carthaginian invasion plan of his brother-in-law Hasdrubal. After Hamilcar's [sic—Hasdrubal's] assassination his young sons took over, with Hannibal becoming the strategus of Iberia, although this decision was not undisputed in Carthage. The output of the Iberian silver mines allowed for the financing of a standing army and the payment of the war indemnity to Rome. The mines also served as a tool for political influence, creating a faction in Carthage's magistrate that was called the Barcino. In 219 B.C.E. Hannibal attacked the town of Saguntum, which stood under the special protection of Rome. According to Roman tradition, Hannibal had been made to swear by his father never to be a friend of Rome, and he certainly did not take a conciliatory attitude when the Romans berated him for crossing the river Iberus (Ebro) which Carthage was bound by treaty not to cross. Hannibal did not cross the Ebro River (Saguntum was near modern Valencia—well south of the river) in arms, and the Saguntines provoked his attack by attacking their neighboring tribes who were Carthaginian protectorates and by massacring pro-Punic factions in their city. Rome had no legal protection pact with any tribe south of the Ebro River. Nonetheless, they asked Carthage to hand Hannibal over, and when the Carthaginian oligarchy refused, Rome declared war on Carthage. The Barcid Empire consisted of the Punic territories in Iberia. According to the historian Pedro Barceló, it can be described as a private military-economic hegemony backed by the two independent powers, Carthage and Gades. These shared the profits with the Barcid family and were responsible according to the Mediterranean diplomatic customs. Gades played a minor role in this field, but Hannibal visited the local temple to conduct ceremonies before launching his campaign against Rome. The Barcid Empire was strongly influenced by the Hellenic Empires of the Mediterranean and for example, contrary to Carthage, it minted many coins in its short time of existence. The Second Punic War (218 B.C.E.–201 B.C.E.) is most remembered for the Carthaginian Hannibal's crossing of the Alps. He and his army invaded Italy from the north and resoundingly defeated the Roman army in several battles, but never achieved the ultimate goal of causing a political break between Rome and its allies. While fighting Hannibal in Italy, Hispania and Sicily, Rome also simultaneously fought in Greece against Macedon in the First Macedonian War. Eventually, the war was taken to Africa, where Carthage was defeated at the Battle of Zama by Scipio Africanus. The end of the war saw Carthage's control reduced to only the city itself. Hannibal's feat in crossing the Alps with war elephants passed into European legend: A fresco detail, c. 1510, Capitoline Museums, Rome. There were three military theaters in this war: Italy, where Hannibal defeated the Roman legions repeatedly; Hispania, where Hasdrubal, a younger brother of Hannibal, defended the Carthaginian colonial cities with mixed success until eventually retreating into Italy; and Sicily where the Romans held military supremacy. Hannibal was a master strategist who knew that the Roman cavalry was, as a rule, weak and vulnerable. He therefore enlisted superior cavalry into his armies, with devastating effect on the Roman legions. After assaulting Saguntum, Hannibal surprised the Romans in 218 B.C.E. by directly invading Italy. He led a large army of mercenaries composed mainly of Hispanics, three dozen African through the Alps. This move had a double edged effect. 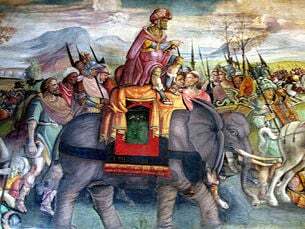 Although Hannibal surprised the Romans and thoroughly beat them on the battlefields of Italy, he lost his only siege engines and most of his elephants to the cold temperatures and icy mountain paths. In the end it allowed him to defeat the Romans in the field, but not in the strategically crucial city of Rome itself, thus making him unable to win the war. The Roman army under Quintus Fabius Maximus intentionally deprived Hannibal of open battle, while making it difficult for Hannibal to forage for supplies. Nevertheless, Rome was also incapable of bringing the conflict in the Italian theater to a decisive close. Not only were they contending with Hannibal in Italy, and his brother Hasdrubal in Hispania, but Rome had embroiled itself in yet another foreign war, the first of its Macedonian wars against Carthage's ally Philip V, at the same time. Through Hannibal's inability to take strategically important Italian cities, the general loyalty Italian allies showed to Rome, and Rome's own inability to counter Hannibal as a master general, Hannibal's campaign continued in Italy inconclusively for sixteen years. Hasdrubal again brought a Carthaginian army across the Alps into Italy, as his brother did before him, making his way into the Po valley. The specter of another huge Carthaginian army in Italy was terrifying, and the Romans knew they needed to cut off Hasdrubal's reinforcements at all costs. In the Battle of the Metaurus River in 207 B.C.E., the Roman commander Gaius Claudius Nero had about 700 of his best soldiers distract Hasdrubal while he himself rounded the river to strike the rear flank of Hasdrubal's army. Hasdrubal, realizing that he was doomed, threw himself headlong into the Roman forces to be killed rather than captured. 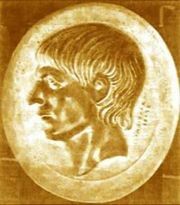 Hasdrubal's head was thrown by the triumphant Romans into Hannibal's camp, whereupon Hannibal and his army retreated into the mountains for a short time. Meanwhile in Hispania, Scipio captured the local Carthaginian cities and made alliances with local rulers. With Hispania essentially pacified, Scipio then turned to invade Carthage itself. With Carthage now directly threatened, in 203 B.C.E. Hannibal returned to Africa to face Scipio. At the final Battle of Zama in 202 B.C.E. the Romans at last defeated Hannibal in open battle. Carthage sued for peace, and Rome agreed, but only after imposing harsh terms, stripping Carthage of its foreign colonies, forcing it to pay a huge indemnity, and forbidding it to own either an impressive army or a significant navy again. The Third Punic War (149 B.C.E.-146 B.C.E.) involved an extended siege of Carthage, ending in the city's thorough destruction. The resurgence of the struggle can be explained by growing anti-Roman agitations in Hispania and Greece, and the visible improvement of Carthaginian wealth and martial power in the fifty years since the Second War. With no military, Carthage suffered raids from its neighbor Numidia. Under the terms of the treaty with Rome, such disputes were arbitrated by the Roman Senate. Because Numidia was a favored client state of Rome, Roman rulings were slanted heavily to favor the Numidians. After some fifty years of this condition, Carthage had managed to discharge its war indemnity to Rome, and considered itself no longer bound by the restrictions of the treaty, although Rome believed otherwise. Carthage mustered an army to repel Numidian forces. It immediately lost the war with Numidia, placing itself in debt yet again, this time to Numidia. This new-found Punic militarism alarmed many Romans, including Cato the Elder who after a voyage to Carthage, ended all his speeches, no matter what the topic, by saying: "Ceterum censeo Carthaginem esse delendam"—"Furthermore, I think that Carthage must be destroyed." In 149 B.C.E., in an attempt to draw Carthage into open conflict, Rome made a series of escalating demands, one being the surrender of three hundred children of the nobility as hostages, and finally ending with the near-impossible demand that the city be demolished and rebuilt away from the coast, deeper into Africa. When the Carthaginians refused this last demand, Rome declared the Third Punic War. Having previously relied on mercenaries to fight their wars for them, the Carthaginians were now forced into a more active role in the defense of their city. They made thousands of makeshift weapons in a short amount of time, even using women's hair for catapult strings, and were able to hold off an initial Roman attack. A second offensive under the command of Scipio Aemilianus resulted in a three-year siege before he breached the walls, sacked the city, and systematically burned Carthage to the ground in 146 B.C.E. The popular story that the ground was seeded with salt was invented in the nineteenth century as there is no evidence of it in any ancient sources. ↑ Chris Scarre, "The Wars with Carthage," The Penguin Historical Atlas of Ancient Rome (London, UK: Penguin Books, 1995, ISBN 9780140513295), 24-25. ↑ Boise State University, The Punic Wars: Results of the Second Punic War. Retrieved July 10, 2008. ↑ Deborah Vess, AP World History (Piscataway, NJ: Research & Education Assoc., 2006, ISBN 0738601284), 725. ↑ Pedro Barceló, Karthago und die Iberische Halbinsel vor den Barkiden (Bonn, DE: R. Habelt, 1998, ISBN 9783774923546). Bagnall, Nigel. 2005. The Punic Wars: Rome, Carthage, and the Struggle for the Mediterranean. New York, NY: Thomas Dunne Books. ISBN 9780312342142. Caven, Brian. 1980. The Punic Wars. New York, NY: St. Martin's Press. ISBN 9780312655808. Cornell, Tim. 1995. The Beginnings of Rome: Italy and Rome from the Bronze Age to the Punic Wars (c. 1000-264 B.C.E.). Routledge history of the ancient world. London, UK: Routledge. ISBN 9780415015967. Cottrell, Leonard. 1992. Hannibal: Enemy of Rome. New York, NY: Da Capo Press. ISBN 9780306804984. Fields, Nic, and Duncan Anderson. 2007. The Roman Army of the Punic Wars, 264-146 B.C.E. Battle Orders, 27. Oxford, UK: Osprey. ISBN 9781846031458. Goldsworthy, Adrian Keith. 2000. The Punic Wars. London, UK: Cassell. ISBN 9780304352845. Nardo, Don. 1996. The Punic Wars. World History Series. San Diego, CA: Lucent Books. ISBN 9781560064176. This page was last modified on 16 June 2015, at 18:38.